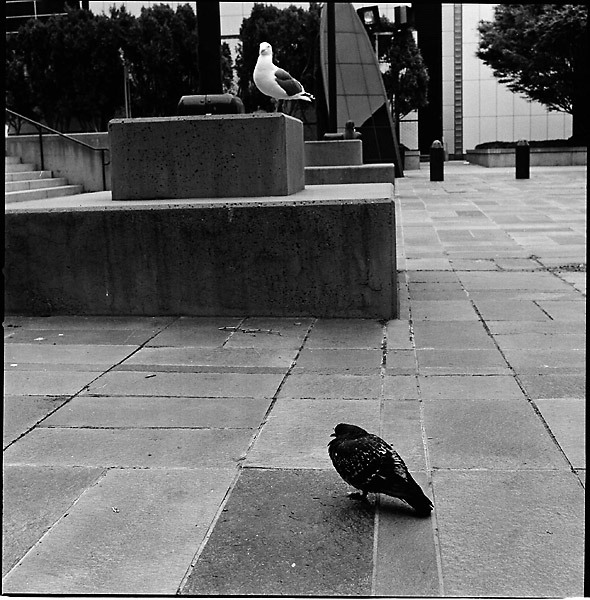 Cold Pigeon: On a cold Spring day in SF, a pigeon hunkers down while a seagull watches to see if I toss any food in their direction. Snapped on: March 22, 2005. Hasselblad 503CX, Planar 80 C T* ISO1000, Kodak 400TMX Professional film, developed with Diafine 3+3 EI1000 (I made a mistake, it should have been EI1600 according to Diafine push recommendations; but now I doubt that, the roll came out very thin).